this past saturday we were ushered into a new stage of life with sammy -- the self-feeding, finger-food stage. in my mind this meant a lovely goodbye to the days of a frantic, starving, little boy clutching at and mouthing certain body parts (most of which i prefer not to have looking damp in public) while i am trying to shop for socks, cook a meal, or attend a meeting with a client (yes, i have been crazy enough to take him to meetings.) huzzah! sammy could be pacified with a small handful of cheerios! i couldn't think of anything cherrier or oh-ier! of course, now we have the related consequence of cheerio consumption...the random-cheerio-rain-effect. i guess it's sort of like lake-effect snow. 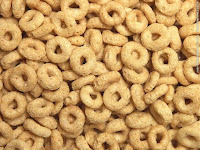 the cheerios blow across the boy, which results in a downpour of cheerios that blanket the surrounding area. or something. at least they're also moist and disgusting. now there's an upside. and can anyone explain to me how a whole cheerio got into his diaper? while he was still wearing his onesie?! ?